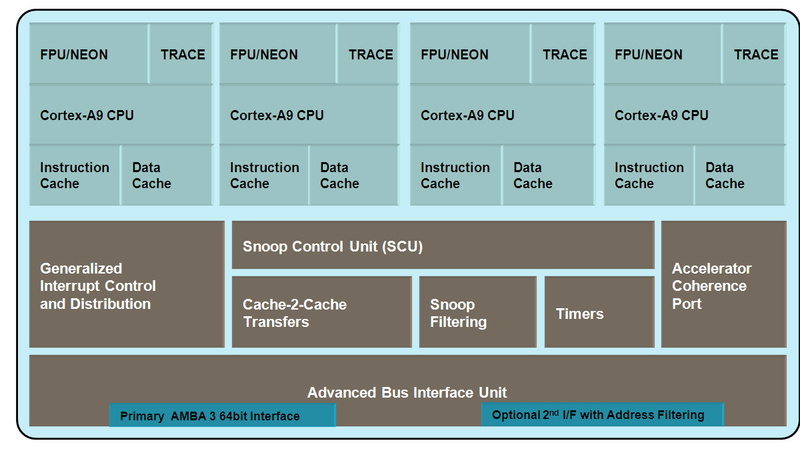 Xilinx is putting a multicore processor architecture onto its next generation of FPGA. The Extensible Processing Platform is a single chip that combines two 800MHz ARM Cortex-A9 MPCore processor-based subsystems with 28nm FPGA fabric to add extra functions for system and ASIC protoyping. This is a significant change, as it provides embedded systems designers with a processor-centric design and development approach rather than an RTL hardware approach. 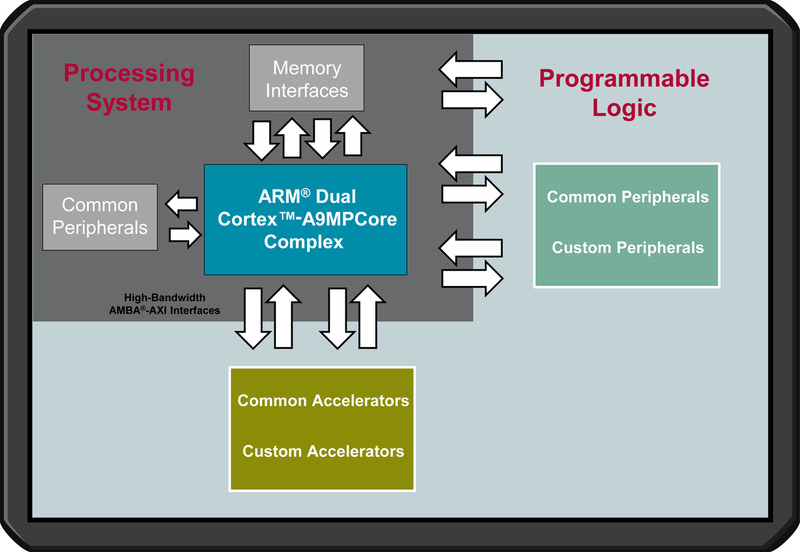 Xilinx sees this has a way of achieving the compute and processing horsepower required to drive tasks involving high-speed access to real-time inputs, high-performance processing and complex digital signal processing — or any combination thereof — needed to meet their application-specific requirements, including lower cost and power. This isn't that new, as Xilinx has integrated PowerPC cores into the fabric of its FPGAs before for telecoms applicaitons, but this is a return in force to the software approach with a more popular embedded core. A software-centric development flow is enabled by a processor-centric approach which presents a full processor system – including caches, memory controllers and commonly used connectivity and I/O peripherals – that boots and can run a variety of operating systems (OS) at power-up, such as Linux, Wind River’s VxWorks and Micrium’s uC-OSII. The programmable logic is tightly coupled with the processor system through the high-bandwidth AMBA-AXI interconnects to accelerate key system functions by up to 100x, using off-the-shelf and/or custom IP. This architectural approach addresses common performance bottlenecks between these parallel and serial computing environments, memory and I/O. It also gives the processor system configuration control of the programmable logic, including dynamic reconfiguration. Software developers can leverage their existing system code based on ARM technology and use off-the-shelf open-source and commercially available software component libraries. Because the system boots an OS at reset, software development can get under way quickly within familiar development and debug environments using tools such as ARM’s RealView development suite and related third-party tools, Eclipse-based IDEs, GNU, the Xilinx Software Development Kit and others. Demand for higher levels of embedded system performance is being driven by end market applications that require multifunctionality and real-time responsiveness, such as automotive driver assistance, intelligent video surveillance, industrial automation, aerospace and defense, and next-generation wireless. In the automotive sector alone, with greater than 50 million cars produced each year, and an estimated 600 million motor vehicles on the road, today’s $1.3-billion-dollar driver assistance market is expected to grow to $5.8 billion by in 2017 as manufacturers deploy more embedded systems in their vehicles to make them safer. With statistics showing that 60 percent of front-end collisions could have been avoided with an extra .5-second response time, or that driver fatigue accounts for an estimated 30 percent of all driver fatalities, the motivation to leverage technology to save lives is clear. As developers of driver assistance systems pack more compute power into their applications, radar and infrared sensors, cameras and other system components must be installed into confined spaces within the automobile. The new Xilinx Extensible Processing Platform offers a single-chip solution for optimizing application-specific hardware/software partitioning and accelerating functions in hardware to drive complex algorithms. This enables customers to further differentiate their embedded systems to gain a competitive advantage in their markets. In a market expected to reach $46 billion by 2013, developers of new intelligent video technologies need processing platforms for building applications that can automatically monitor video patterns and body language, combined with audio, to make intelligent decisions and send alerts, thus reducing the chance for errors. The technology is already moving to full high-definition video and frame rates up to 60 frames per second, but current solutions do not offer sufficient compute power for image processing and advanced analytic functions. The dual Cortex-A9MPCore-based processor system, coupled with the massive parallel-processing capabilities of the programmable logic, enables this capability. Developers also gain an opportunity for innovative algorithm design, scalability and field upgradability within a familiar ARM-based design environment. Wireless telecommunication is being driven by the need for lower power, smaller physical form factors and reduced development costs, to support an ever-increasing number of users and data-hungry applications. New technologies such as 4G LTE (Long-Term Evolution) can address bandwidth requirements, but smaller, more efficient base stations are essential to meeting overall market requirements. The Xilinx Extensible Processing Platform will help developers of next-generation wireless base stations to meet these needs by providing high-bandwidth parallel processing of 4G signals in combination with multiuser data management on Cortex A9 processors – all in a small, power-efficient, cost-effective integrated solution. Because the platform is extensible, developers have the flexibility to implement future equipment updates and performance upgrades of both hardware and software. 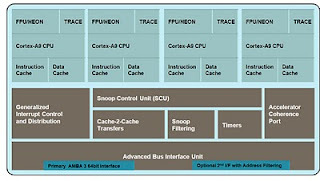 The new Extensible Processing Platform is part of Xilinx’s Targeted Design Platform strategy, which provides customers with market- and application-specific environments that are easy to use, enabling them to evaluate and understand technology, and finally provide application platforms that can be modified and extended to accelerate their development time and focus on differentiation.